China Glaze World's Away Collection! My Picks! Hey guys! Happy New Year's Eve! Any fun plans? We are hanging out at home tonight... I'm too old to stay up late and go to bars, lol. Sp, I managed to control myself and not buy the entire China Glaze World's Away collection. China Glaze has that power over me.. I need to work for them! Hire me, please! Just so you know, you get to see my stupid right hand in some of these pictures. Sorry! First is Running In Circles, a GORGEOUS shimmery green. So so so so pretty! I used 2 coats, no top coat. Next, It's A Trap-eze! This is probably the most popular polish from this collection, at least based on swatches I've seen. It's A Trap-eze is a white based polish with rainbow glitter. It's very Indie-ish! I used 3 coats here. Next, Whirled Away over Running In Circles. I was SUPER excited for this polish and was subsequently a little disappointed with it. It was very very thin... I let it sit open for a while and that did help. (True fact, that's why you get to see my right hand... I was being impatient while waiting, lol). There was definitely fishing and placing and moving around involved with this but... I do kind of love it. Next, Get Carried Away over Cult Nails Bitten. This didn't have the same thin issues as Whirled Away, it was actually a little too thick. I used two coats, no top coat. What did you think of this collection? What were your favorites? Today's Guest Post is from Amber from NailsLikeLace. 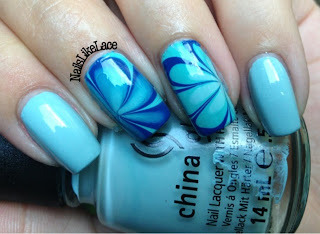 Check out her awesome watermarble, of which I am so jealous because I am an epic failure at watermabling, lol. If you would like to supply a guest post for this weekly segment on my blog, just click on the Weekly Blog Post tag at the top! I'd love to see your post! I just want to say thanks so much to Amanda for letting me guest post, she is amazing! 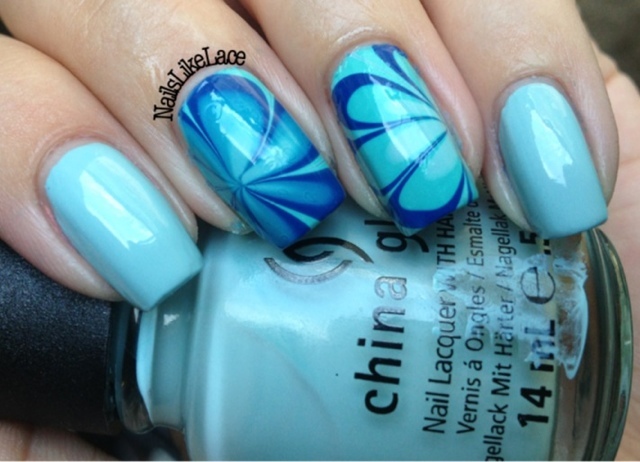 I’m Amber from NailsLikeLace and I decided on a water marble in shades of blue for you today. I started out with a base of China Glaze Kinetic Candy for these nails, and then created a simple (I wish I could do more detailed, intricate marbles!) floral marble with Kinetic Candy, China Glaze Aquadelic, and Essie Mesmerize. I have found that China Glaze does wonders for water marbling! I’ve never tried one that doesn’t spread amazingly, even my slightly on the thicker side, Kinetic Candy! I am, by no means, I water marble pro! I always seem to get tons of bubbles no matter what I try. These are some of the best that I have done to date, and I really love how they turned out! Thank you again, Amanda for letting me post here! It’s an honor! Well she looks like a pro to me! Thank you so much, Amber! I love these colors together! Naild' It Dragon Scales is something that was an impulse purchase after I helped Amanda decide what polishes she should buy. I had no intention of buying anything but after googling swatches to help her decide, it became obvious that I kind of needed this baby. Dragon Scales is packed with blue, purple, red, green, black, and white glitters of all different sizes. I used 1 coat here over Zoya Blaze. Hey guys! Happy weekendddddd!!! We are having a New Year's Eve party tonight... yeah yeah, I know it's not NYE but whatever. Don't judge me, lol! Today's polish is from Amanda at Nail Polish Enthusiast, aka The Other Half Of My Brain. I swear, we are the same person. It's a little freaky. Nutty Hat Guy (which I keep typing Nutty Hate Guy, so if you see that somewhere in this post, just ignore me. I'm a dummy) is a pinky purple glitter with sprinkles of red and green in the mix. I used 3 coats on its own here, no top coat. This was a peach to apply, no issues at all :-) Thanks Amanda!!! Hey guys! Can you believe that it's almost January/a new year?!?! I can't!! Where does the time go?? Today's installment of December Untrieds is one of my favorites :-) Go see what Amanda and Madeline posted! Today I have a lemming of mine that I fulfilled recently! CrowToes Absolum is just packed with green, blue, orange, and silver glitter. It's so gorgeous and shiny and lovely and I love it. I used two coats over WnW Black Creme. I purchased this at Llarowe's website. I put off purchasing Illamasqua Phallic for a long time because... well the name skeeved me out. But I couldn't resist the gorgeous blue any longer so I finally bought it. This is 2 lovely coats of Phallic, no top coat. The shimmer in this was much more evident in person. Then I added an accent nail of Revlon Midnight Sparkle, which looks like it was made for this pairing! Hey guys! Merry Christmas Eve! I can't believe it's already December 24th... crazy! Today's Untried's polishes are brought to you by Essie! Go see what Amanda and Madeline are up to! Leading Lady is just about the snazziest little red glitter polish evah. I used 3 coats on it's own. Beyond Cozy is a silvery champagne microglitter. This was also 3 coats. And that's about as Christmas-y as I got with my nails this year, lol! Hey guys! Only a few more days until Christmas! Are you ready?? Today we are having our annual cousins Christmas get-to-gether.... I cannot wait for the salt cured ham and cheesy potatoes!!! MMMM!!! A few untrieds to show you today. The first is Maybelline New York in a copper color that I received in a swap with Saira. This was 2 coats. Then I added two coats of Finger Paint's Elves Bells. Hey guys! What's everyone up to today? I have to make some sugar cookies and clean a bit, but other than that, I don't have plans for today. My Christmas shopping is done, and everything's wrapped. Whoohoo! Today's post is Layla Hologram Effect Red Taboo. I'm not usually big on red nail polish, but every now and then, I want some red nails. And red holo nails? Yes please! So when I saw Layla was releasing new holo colors and there was a red holo, I was pretty excited. Do you have any polish disappointments? Oceans of Alloys is a lovely color and I love the idea of this polish... but I just don't love it on me. This was 3 coats. It was a little bit thick, too. Pegasus is a light purple polish with silver and white glitter. Again, I love the idea of this polish but it just fell flat for me on the nail. Again, this was 3 coats, and it was pretty thick. Labels: blue , copper , glitter , HARE , purple , silver. December UNtrieds: Jindie Nails Polishes! Today's Untried Challenge is a little Christmas-y...wonder what Amanda and Madeline are up too.. I have some glitter skittles to show you using Jindie Nails polishes. I used two coats of each over OPI MY Boyfriend Scales Walls. They were all very easy to apply, no fishing, placing, dragging, pooling, flooding, etc. etc. I think Rainbow Cloud is my favorite! You can buy Jindie Nails on Etsy. Today's post is very..... clean. If you've followed me for any period of time, you might have noticed that I don't use a lot of white/neutral colors. They look so great on others but they just bore me. I don't know why. So, it looks a little weird to see such a clean manicure but even I have to admit... I kinda like it a bit. Others Pale By Kim-parison is from the Kim Kardashian inspired Nicole by OPI collection. It's a pale jelly white, that allllmoost looks the tiniest bit pink. This was 3 coats. Welcome to another edition of December Untrieds with Amanda and Madeline. I added 2 coats of Candy Lacquer Rarity over Jo. Rarity is full of white and purple glitter and looks fantastic over Jo! What do you guys think? 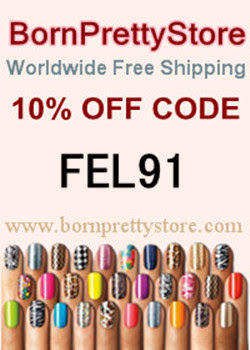 Have you tried any Candy Lacquer or Zoya polishes? What are your favorites? Lac Attack Magical Musings Collection!